In the vibrant fall season, we admire the oranges, yellows, and browns of our oak landscape, but what about all of the colors we can’t see? 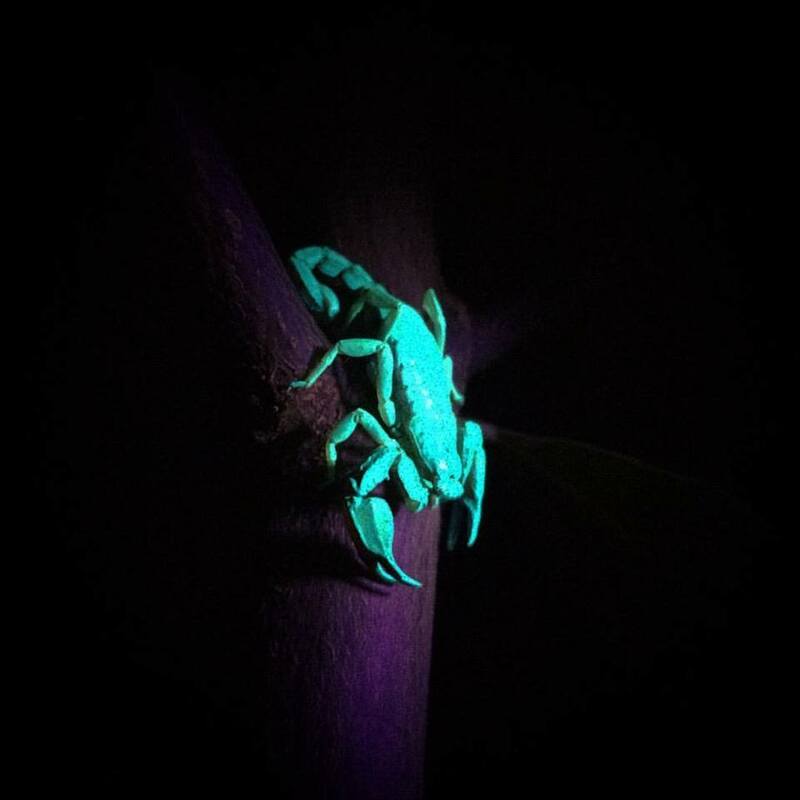 Under ultraviolet light, the natural world glows and fluoresces in a surprising way. Much of the natural world--like insects, birds, crustaceans, fishes and reptiles--can see ultraviolet light. As ecologists, if we ignore the ultraviolet light, we ignore the color contrasts that guide so many creatures’ understanding of the world. Last month, Grassroots Ecology staff and community members explored Byrne Preserve at night, viewing the oak woodland for the first time in the ultraviolet spectrum. We carried small ultraviolet flashlights that allowed us to examine the world that we cannot see with the naked eye. Millipedes that had looked brown and simple during the day fluoresced so bright under blacklight that they captured our gaze and made us stop to watch their path. The millipede legs we illuminated with our flashlights displayed a riveting rhythmic pattern, moving in sequence like oars on a boat. One of our goals for the night was to see the star of the show: the Western Forest Scorpion. Most northern Californians are surprised to hear that we have scorpions in our open spaces, but we do. This nocturnal critter of the woodland area comes out at night to hunt, and under blacklight, glows blue from the ultraviolet rays. Its intricate armor and robust pincers are stunning to encounter. Unfortunately, we had no luck sighting the scorpion during this hike at Byrne Preserve, but we hope that another hike will prove more fruitful. Ultraviolet (UV) light is the spectrum of radiation between 10 and 400 nm. UV radiation is present in sunlight but is beyond the spectrum of light humans can see. Since many insects, mammals, and birds can see UV, it begs the question of what we are missing. Many flowers, for example, have intricate UV reflecting patterns pointing toward nectaries, guiding pollinators to the bull’s-eye. Two butterflies that look similar in visible light may look drastically different to UV-sensitive eyes. UV colors and patterns affect how animals hunt and mate. But why do millipedes and scorpions fluoresce under UV light? It turns out this is a tough question to answer. The situation in which we, as humans, observe a millipede or a scorpion fluorescing is contrived. We go out at night, when there are no UV rays from the sun, and place a blacklight on a critter that normally would be hiding during the day. This process makes it difficult to imagine the biological benefits of fluorescence. In fact,scientists debate the reasons why scorpions glow. Some scientists think that it helps scorpions determine when to come outside. As their UV detecting exoskeletons sense the radiation when the sun is up, it may indicate to the scorpion that it should stay hidden. The glowing could also be a form of sun protection. The reflecting of the UV radiation could protect the scorpion from incurring harsh damage from the sun’s rays—in fact, some sunscreens use this same principle. It also could aid the critters in finding each other, or it could help confuse their prey. If nothing else, their exoskeleton make-up provides us with the treat of observing their splendid glow--if only we know when and where to look. To join us for our next night hike, take a look at our eventbrite page. However, you don’t need to wait for one of our hikes to start exploring the mysteries of the natural world at night. We encourage you to buy a UV light and explore your own backyard—you may be surprised to see what you find!